I have been hand quilting for about 6 years now. I learned to quilt by doing it…no one showed me the “right” way so I just did what felt right. When I started I didn’t use a thimble but it didn’t take long to make a hole in my thumb…so I made a thimble for my thumb with leather and tape which wore out quite quickly. I made several more with differing materials. I finally made one with a copper pipe fitting lined with fabric and glue…this is what I am using in this short video . What you can’t see in the video is what I am doing with my other hand. I use my index finger to push the needle back up to the front …my index finger does most of the work…the copper “thumble” is what I push the needle through with. My index finger and thumb hold the needle and move it down…my other hand pushes it back up with each stitch. 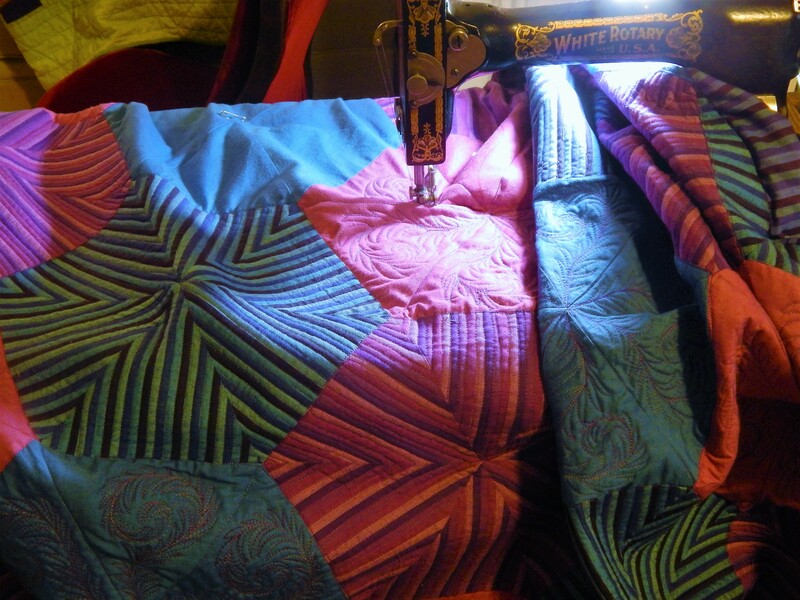 I have tried conventional hand quilting but I find it so much faster this way! So that is the Tim way of hand quilting…I am sure that it is not the best way, or the right way, or the only way, but it is my way. This entry was posted in Quilts and tagged hand quilting, hand quilting video, Quilts. Good grief, no wonder I can’t hand quilt worth a darn! Plus it looks even harder because you’re using the wrong hand (:))! hahahha…its the right hand for me! At last, someone quilts like me, except that I am right handed. Thought I was doing it all wrong. You are an inspiration, beautiful quilts. I am left-handed and it feels so good to see someone actually quilt left-handed. However, that being said, I ended up learning to quilt right-handed because I could not find a “lefty” to teach me. How freeing this is. Whenever a lefty needs to learn from a righty, place a mirror in position to capture the righty’s hands. The lefty then looks in the mirror. This was told to me many years ago by a left handed crocheter. I was trying unsuccessfully to teach by left handed son to tie his shoesat the time. IT Worked! She told me that was the way she learned to knit and chrochet from her grandmother a righty! Boy could she make those needles fly….. I think a lot of times you can learn L handed by sitting across from someone. I deal cards left handed and play L handed because my brother sat across from me to teach me how to play cards. I am R handed for everything else! I agree…the right way is the way that works! Your stitches are wonderful! I’m so glad you did this little video so we could see you quilting. And I agree — whatever method works best is the one to use. I get it, actually it looks fairly easy. I might be tempted to try it now. Wow! A thimble made from a pipe fitting! i guess a silver thimble wouldn’t impress you. Ha Ha I really love that you shared what works for you, just shows you if there is a will, there is a way. I would love to have a silver one custom made to fit my thumb! !…..Christmas is coming…. So cute that Teddy showed up for the video……had to see what all the excitement was about! lol And you are certainly fast with that thumb method……I’m going to try that! It doesn’t look like there is any strain on your hands while doing it, too…..my hand gets so cramped up when I hand quilt. My friend, who is a lefty, always said she could never teach me any crafts, because it would be backwards. But then I sat facing her, and just mirrored everything she did, and it worked out fine! She does beautiful knitting, crocheting, quilting, crewel work; I really wanted to learn from her! Fascinating! You make it look so easy, and I love that you invented your own thimble! Wow, the wrong hand AND the wrong directions! LOL Hey, whatever works for you, right? I don’t think there is any right or wrong way. Your work is beautiful, and this quilt will be a masterpiece. It is different …the thing that I cant figure out is how to quilt in a frame…the way I do it I have to turn the hoop constantly because I can only go one direction! A lefty quilter! Thanks for showing how you quilt. My Mom tried to teach me to quilt with the thimble on the third finger and the rocking motion which is how I quilt. My Mom’s quilting was perfect little even stitches. Mine is not little or sometimes not even but it is not bad, it is just the way I quilt. Whatever works for each person is the right way! I agree….as long as it works it is right…or left in my case. I know I’ve already commented on here, but I’ve watched your video again and think the next time I do some hand quilting, I will give this way a try. I do it the ‘conventional’ way. It does seem like this way would be quicker. I’m rather impressed with this method! Left-handed people are always more creative! No I am not a lefte. Thanks for this video. I agree, the “right” or correct method is the one that works for you. I’m surprised that your copper thimble hasn’t left marks on your white fabric. 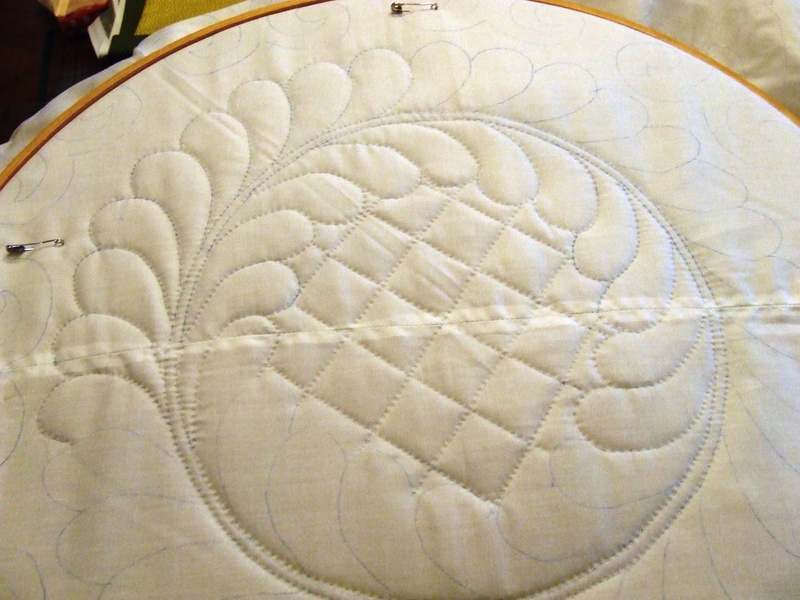 I learned to hand quilt on a floor frame, so I can see why you’d prefer a hoop. The only advice I’d give you is try to develop quilting in more than one direction. It will help save wear and tear on those muscles and soft tissue you are using repetitively, plus it will be a good challenge for you to move forward!Thanks for sharing your method. You DO do it different than any way I have ever seen. As I sit quilting on my clamshell ( yes, I’m still plodding along on that one) I have thought and thought about your method and what it was like. I’m soooo glad to finally see it!! Great video!! OMG!……and your a lefty on top of it all!!! So creative! I can definitely see why you have such great stitching. I agree with Sue above. The right way to quilt is what works for you after you’ve played around with it. I read in a one of your later posts, Tim, how the amount of humidity in the air makes quilting more difficult. I had never thought about that, but I can see why it would be so. http://www.thimberlady.com. This is where I got mine, have one for my middle finger and one for my thumb. Her design has changed over the years. I’m always on the lookout for a thimble with really deep dimples – like Thimblelady’s or Roxanne’s. But, if I understand you correctly, you don’t need dimples *at all* quilting by your method. Brilliant! Excellent video! I would live to see you quilt ‘curvy’ lines, like feathers. You certainly have an original technique! Thanks so much for taking the time to make the video. Thanks! I will have to do another video with curves….I do it the same way….just keep turning the hoop…. what ever it was I am glad you found it!…thanks for visiting! It is not easy to find a thumb thimble, but I think easier if you dont need one for a thumb as big as mine…. I an so glad you shared this! I learned to quilt from my grandmother. she didn’t insist that I do it her way she encouraged me to do what felt most comfortable for me…. which was quilting by pushing the needle with my thumb! my grandmother said many women in her quilting group did that. She could quilt in any direction because she could push the needle with her middle finger or her thumb. The main thing she encouraged me to be was consistent with my stitch size. I really like your work. I also really enjoy hand quilting. Well Tim I must say, I am impressed!!! I could never be this good at quilting and I guess it’s true when people say only *Only left handed people are in their right mind*. I love seeing your work. Thank you for sharing your wonderful craftsmanship with us, you are the best! A brief and partial view of Ted the Man! You take fewer stitches per “run” but move faster. I’m instructed, will practice. Thank you for showing this, Tim. I do take fewer stitches per run…but this way I don’t have any trouble pulling the needle through….there is lots of talk on the Celebrate Hand Quilting Facebook page about needle pullers of various kinds and it baffles me why they don’t just take fewer stitches and then the needle pulls through with no effort at all….and Happy Practicing!! I watched “utility quilting” a while back. Today I watched the regular hand quilting video. I couldn’t believe what you were doing. I think that I am caught up in all of the” rules”. I think that I will try your method and others plus different thimbles, threads and needles plus hoops and hoopless and see what feels good. If it feels awkward, it is not going to work for me. I will let you know. Hugs to that cutie patootie Teddy. For me the secret is just that….if if feels awkward try something different….rules are nice for some people but not me! Fun to see how you do it. My needle moves about the same way but I push toward me with my middle finger. Backwards I am, I guess! The idea of learning things from people who are other-handed works for me. I’m a rightie and could NOT teach myself to knit…until I sat with a leftie. It all clicked then. The mirror-imaging worked for me. I definitely have to try the Tim method. Teddy approved, no doubt, and that’s good enough for me! The only question I have is–does your thumb ever get cramped? Hi Tim. I finally got the courage to try hand quilting. I tried several methods and felt comfiest without a hoop, and a very similar method as yours to sew. My stitches are huge! I guess with practice they should get smaller, but it does feel as if the wadding is too thick to enable me to make smaller stitches. Before I rip it all out to try with thinner wadding, can I ask what wadding you used in the demo? I am making a wall hanging, so don’t need warmth in this instance, but if I were making a quilt for the bed, I would use warmer (thicker) wadding. What do you recommend?? By the way, I absolutely love your work! the batting (wadding) in the demo is Hobb’s Tuscany wool. I would try a sample with no batting at all….if you can get that to work then try a thin batting….I don’t know what brand to recommend because I use thick batting, I have tried quilting without a hoop because some people tell me that is how they do it, I get uneven huge stitches, no matter how I try I can not get a good result without a hoop… I need the hoop to make even small stitches…the hoop holds the fabric so I have both hands to make the stitch….the bottom hand pushed the needle back up to the top (you can’t see that in the demo)…and the top hand pushes it back down ….neither hand holds the hoop….that rests on the edge of a table or against your body…. Thanks for your reply. I guess the old saying ‘practice makes perfect’ applies here! I will try your suggestions to get the technique right. 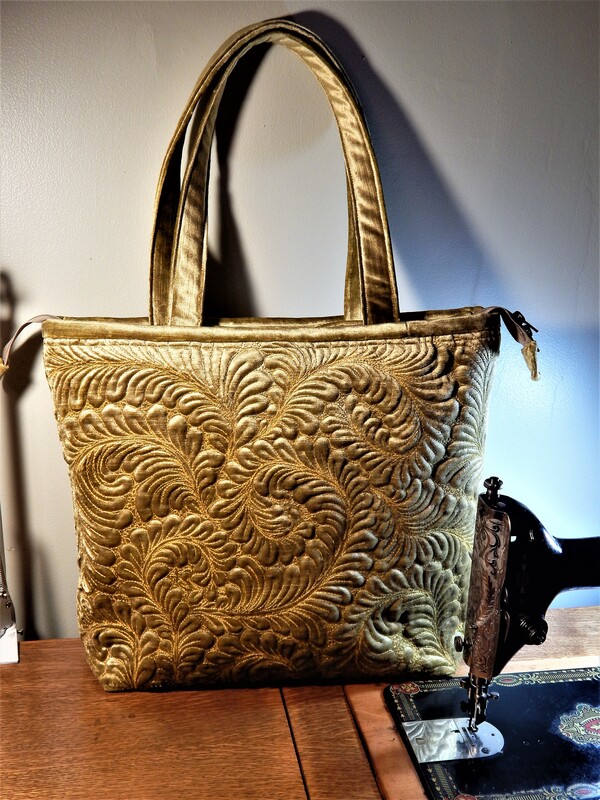 Keep sewing and posting, you are so inspirational. I tried to watch the video but it said the video wasn’t loaded. Does this mean anything to you. I was reading the comments and I sew left handed but crochet right handed. Isn’t that weird. I am left handed when I write and eat.. I don’t use a hoop. How many stitches do you get per inch? 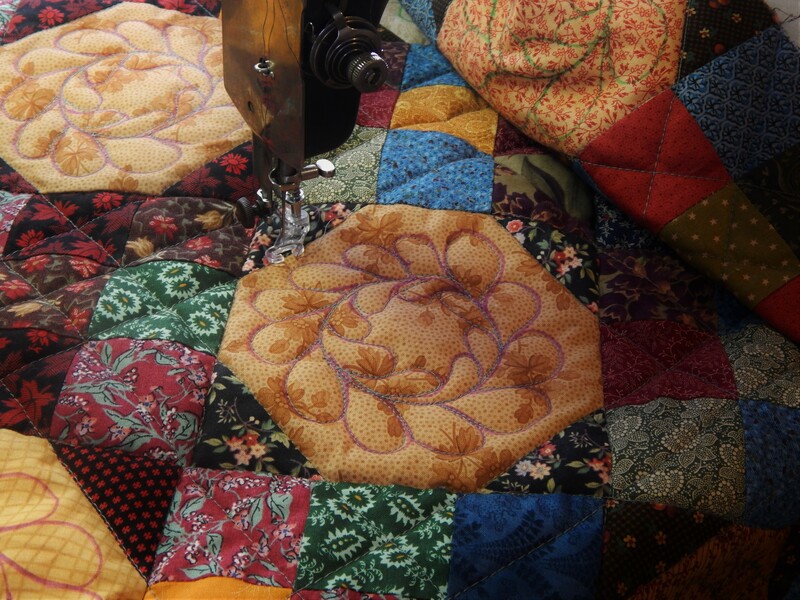 Love your Blog and the great quilts you have. Not sure what might be up with the video not working …it is fine on my end…perhaps try re-starting your computer and try again…. Tim, I too love to hand quilt but am a beginner. My first quilt took me over a year to do the hand quilting because I didn’t get to do it every day. The squares were assembled by my great grandmother in the 1950s or 60s. Given to my mother in the beginning of the 60s she passed them down to me when I got married at 18. I’d never quilted in my life but had watched my mother many times. I had to applique on the machine, the southern belles in the squares and measure and cut to size each square and add borders between them to make it a larger quilt. I finally got serious about finishing it so I could pass it down to my daughter and down to her daughter and so on. It is so special to me that I don’t have the heart to put it on a bed for fear of kids jumping on it and tearing out stitches. I wish I could get the video to play cause I sure need to see how you do yours. I am looking for a quilt frame for my 84 year old mother in law I cant decide on a lap frame or a larger frame, she has a set she has used for 60 years and they were her mothers so it is time for a new set she wants something smaller can you recommend one that is sturdy. Hello, Tim. I have been visiting for some time this morning and enjoying everything! I have a question: What are you using to mark your quilting designs? So far, everything I have tried has been useless and frustrating because it would not wash out! Tim. This reminds me of the aunt Betsy tool. I have one but can’t get the hang of it. Thanks for your video. I love your work. Thank you. I’ll just continue to do the best I can. Your left handed? That is and interesting way to quilt . I have only done I full ,one queen, and a few small quilts . Had a hard time with thimbles ,tried leather, reg., ones with the magnet on the end, ring type, then I found the Roxane and love it . I think because I always wanted to push the needle with the side of the thimble or the end but couldn’t keep the needle in the little dimples. The only problem is it’s heavy on your finger after a while. I have in vested in a R.J Lane it was pricy but lighter. I haven’t had a chance yet to use it on a quilt though. I am doing throws for 2 sisters and 4 brothers and tying those,when I am done with those I have promised my self to get a quilt and start hand quilting again. it’s been 2 years since my shoulder surgery, and it hardly ever hurts any more so I think I can do it now. Thank you so much for sharing your work, the video was great . Happy Quilting and say hi to Teddy he looks like a wonderful companion. Funny how it goes. I watched someone else’s video today and they quilt the same way and then I realised they were a lefty and I wandered if that method is simply something that comes naturally to a lefty and now I have seen your video and hey its the same technique. Half my family are lefties (or cacky-handed) and half are right handed, I’m right my mother is left. My mother taught me to knit, crotchet, embroider, sew on the old treadle, we did macrame together, we did weaving, anything craft related we had a go. Pretty sure she did the facing each other for crotchet but I watched over her shoulder for knitting and somehow I worked it out. Thanks for this very effective video. I would have liked to see the top of this diy thimble.. Is it used to squeeze the needle into the fabric or to protect your thumb or both at the same time?? Also, do you quilt only going upright? Sorry for asking these questions but I am a starter and feel so lost when I see what is on the internet. Your way of quilt seems to offer a perfect result and is quick to do so I would like to give it a try. Thanks again for your generosity in sharing videos and comments. Hi Tim!! Just wanted to say hi and thank you..You are a huge inspiration for me . I am a newbie quilter and love hand quilting but am still learning…I love coming here and read and learn and get inspired by you (and your sweet doggie 🙂 ) and wanted to say that because of the way you talk about handquilting it reminds me to enjoy and have fun and not freak out over everything…so THANKS!! !have a great day!